Snazz up the humble gnocchi and let it be the surprise ingredient in this delicious salad! Note: A simple olive oil and lemon dressing works well, we added some basil pesto for extra flavour and seasoned with salt and pepper. Steam asparagus for 8-10 minutes, making sure not to over-cook them. Take off the heat and let them cool. A bowl with ice cubes stops the cooking entirely. Cook a corn on the cob and/or charr it on a barbecue or griddle pan. – Charring is optional and will add extra flavour! 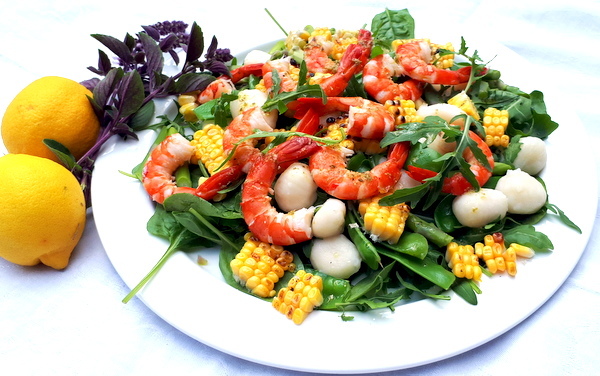 Arrange spinach and salad leaves on a large platter and add the corn, sugar snaps and gnocchi. Top with prawns. For the dressing, blend olive oil and the juice of one lemon with 2-3 tsp of basil pesto and drizzle across the salad. To cut the corn kernels off the cob, place a clean kitchen towel on your bench. Stand the cob up on its tip and carefully run a sharp knife along the centre of the cob, allowing the kernels to drop onto the kitchen towel. Now you can easily transfer the kernels into your salad bowl. To make basil pesto at home, you’ll need a food processor – add ½ a clove of garlic, 3 good handfuls of fresh basil, a good handful of Parmesan cheese, a handful of pine nuts, extra virgin olive oil and blend until smooth. Add a little lemon juice to adjust the consistency to your liking. Add to your salad dressing and reserve the remaining pesto in a clean glass jar in your fridge for later.